Claude Elwood Shannon, the father of information theory, was an extraordinary American mathematician and electrical engineer. Educated at Michigan University and MIT, Shannon took George Boole's binary logic algebra and used it to solve the problem of electric switching circuits. Thanks to his dissertation, considered the most important of all times, today this binary system is the basis for all the computers. 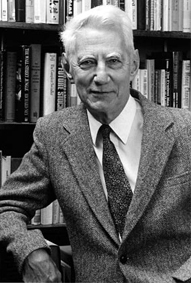 He was dealing with the concept of entropy, the measure of uncertainty, and his findings are applicable not only in computer science and on the field of communications, but also in modern psychology, cryptography and nucleic acid and protein coding. While he was working at Bells Labs, he was dealing with constructing devices, among other things. One of them was a chess-playing machine, for example. What is particularly important about his work of that time, it became a basis for development of an artificial intelligence. Strange man he was, that Shannon. Known by his passion for juggling, and for riding unicycle, he was highly innovative person. Lot's of everyday stuff, as we consider them today, were developed thanks to him. He was the first man to use a word bit, as a shorter term for binary digit, the information unit, his work was essential for digital encoding developmentâ€¦ the list of his accomplishments is very long. Claude Elwood Shannon was also interested in roulette playing, and he tried to construct a device for predicting the outcomes.